사람들이 스마트폰이나 태블릿PC를 들고 간간히 웃음을 터트린다. 더러 심각한 표정도 있다. 이들이 보는 것은 바로 웹툰. 언제어디서나 볼 수 있는 웹툰은 사람들의 스트레스를 푸는 청량제가 되고 있다. 웹툰은 웹과 카툰의 합성어로 단순히 만화책을 스캔해 웹에 올리는 만화가 아니라 인터넷 환경에 최적화해 만들어진 만화를 말한다. 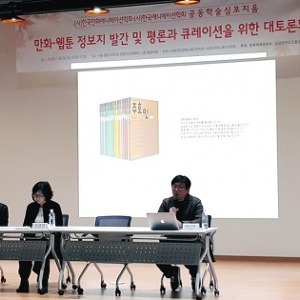 인터넷 개인홈페이지를 만드는 것이 유행하던 2000년대 초반, 자신의 이야기를 그림으로 표현해 올리면서 최초의 웹툰 형태인 일상만화가 시작됐다. 웹툰이 하나의 만화 산업으로 자리 잡을 수 있었던 건 네이버, 다음 등 국내 주요 포털사이트의 힘이 컸다. 2000년대 중반 무료 웹툰 카테고리를 만들면서 하나의 트랜드로 자리 잡게 됐다. 최근 이슈가 된 웹툰은 스틸레인. 스틸레인은 김정일 북한 국방위원장 사망 직후를 배경으로 한 것으로 핵전쟁 위기, 쿠데타 발생 등 김 위원장 사망 이후 한반도 상황을 심각하게 묘사하고 있다는 점에서 관심을 끌었다. 하지만 대부분 인기있는 웹툰은 웃음을 목적으로 한다. 600회를 돌파한, 누적 조회수 10억 회의 개그 웹툰 마음의 소리, 한국 교육현실을 담은 입시명문사립정글고등학교도 꾸준히 사랑받는 작품이다. 작가들에게도 웹툰은 좋은 작업 공간이다. 주요 포털 웹툰 카테고리에는 아마추어 작가들이 자신의 작품을 올릴 공간이 마련되어 있어 공모전이나 출판사를 찾아 돌아다닐 필요가 없어졌고, 쌍방향 커뮤니케이션이 가능해 작품에 대한 반응을 바로 알 수 있다. 인기 웹툰은 거꾸로 출판물 제작으로 이어져 온라인에서의 인기를 이어가고 있다. 책뿐만 아니라 웹툰에서 여자주인공이 부르는 노래가 OST로 탄생되기도 하고, TV 애니메이션으로 만들어져 애니메이션 전문 케이블 채널에서 방영되기도 했다. 웹툰의 제작범위는 영화까지 확장됐다. 강풀 작가의 경우 웹툰을 원작으로 현재까지 6편이 영화화됐다. 웹툰 이끼는 영화로 제작되어 300만여 명의 관객을 동원했다. 하지만 이끼 외 다른 웹툰 원작 영화들은 그다지 좋은 성적을 내지 못했다. 최종호 작가의 스릴러 웹툰 봉천동 귀신은 미국 유명 만화가 스콧 맥클라우드의 홈페이지와 미국 만화 전문 사이트 코믹얼라이언스 등에소개되면서 유명세를 타기 시작했다. 외국 독자들은 봉천동 귀신을 보고 놀라는 모습을 유투브에 올리기도 했는데, 이는 한국 웹툰이 외국에서도 통할 수 있다는 것을 보여준 사례이기도 하다. 이렇게 봉천동 귀신이 국내외 독자들에게 인기를 끈 것은 새로운 기법으로 더 큰 공포를 느낄 수 있도록 했기 때문이다. 수출된 웹툰도 있다. '신과 함께'는 일본 만화 잡지 영간간에 판권이 팔려 리메이크되고, <3단 합체 김창남>은 영국 영화제작사와 영화화 계약 맺었다. '열아홉 스물하나'는 프랑스 출판사와 출판 계약을 마친 상태다. 최근 웹툰은 태블릿PC로 웹툰을 제작하는 일명 탭툰과 만화 작품 하나를 통째로 앱으로 옮긴 앱툰 등으로 진화를 거듭하고 있다. 이렇게 웹툰시장이 확장되면서 웹툰 작가들에 대한 지원도 강화되고 있다. 한국만화영상진흥원은 만화비지니스 센터를 설립해 웹툰 작가뿐만 아니라 만화 작가와 만화산업 관련 업체들에게 저렴한 임대료로 작업 공간을 대여해준다. 기존 만화가들이 새로운 디지털 환경에 적응할 수 있도록 다양한 교육도 시행하고 있다. 웹툰은 2000년 이후부터 20~30%씩 지속 성장세를 거듭하고 있다. 웹툰의 페이지뷰 건수도 다음 2억 건, 네이버 9억 건을 넘겼다. 이를 단순 광고 단가를 기준으로 평가해보면 약 3천 4백만 달러 규모가 될 것으로 추산하고 있다. 그러나 웹툰이 무료로 제공되는 점은 해결해야할 문제로 지적되고 있다. 만화왕국이라고 불리는 일본의 경우는 현재 기존 만화가 인터넷용 포맷으로 서비스되는 형태가 주를 이루고 있다. 프랑스의 경우 실험적인 측면에서 작가들이 인터넷을 활용한 만화 작업을 진행하고 있지만 우리처럼 대중적인 단계는 아니다. 한국은 웹툰비즈니스에 가속도를 붙이고 있다. 2013년 프랑스 앙굴렘 국제만화페스티벌에서 한국 특별전 유치해 웹툰의 매력을 세계에 알릴 계획이다. 그동안 더 많은 사람들이 웹툰을 볼 것이고 잠재력을 잘 알고 있는 작가들은 더 많은 작품을 만들어 낼 것이다. This is a typical scene on the streets of Seoul... people glued to their smart phones and tablets... occasionally smiling... and some... very serious. They're enjoying a webcomic... widely called webtoon in Korea. Webtoons are now a popular way to unwind... for people seeking a breath of fresh air... away from their everyday stress... while on the go. Webtoon is a combination of "web" and "cartoon." This is different from online comics that simply scan books and uploaded page-by-page. Webtoons are those created with image editors or other internet tools... so that they are optimized for online reading. The trend began to pick up in early 2000 as more and more internet users opened their personal homepages. Many of them posted comic strips on their websites... sharing their funny experiences in everyday lives. This was the beginning. The explosive growth of domestic Internet portals like Naver and Daum also helped webtoons to become a major industry. And by mid-2000, they began to offer free webtoon sections... which became an instant hit. This is from a webtoon titled "Steel Rain"... which became quite an issue recently. The story is based on North Korea... after Kim Jong-il's death... describing nightmarish situations like a nuclear war and coup d'etat on the Korean peninsula. It drew a lot of attention as it realistically portrayed post-Kim Jongil North Korea. But most popular webtoons are for laughs. "The Sound of the Heart" has been hit more than one billion times... now topping more than 600 episodes. Another successful piece is "Jungle High School"... with its cynical message to Korea's education system... in which students are in a rat race to enter leading universities. For artists, the webtoon format is a favorable workspace, so to speak. Amateur artists can always post their works in major web portals so they no longer have to wait for contests or search for opportunities at publishing companies. The Internet makes two-way communication possible so they know how users feel about their works almost immediately. Popular webtoons are even made into print comics. So the popularity continues off line. Not only books. We even saw a song by a webtoon character released as an album. Webtoons are also transforming into TV animations... like this one which aired on a cable channel. They are also hitting the silver screen. Popular webtoons by an artist named Kang Pul have been made into movies. So far... six in total. "The Moss" was made into a movie and drew three million movie-goers in Korea. But unlike this one, other webtoons did not do well. "Bongcheon-dong Ghost" is one good example. 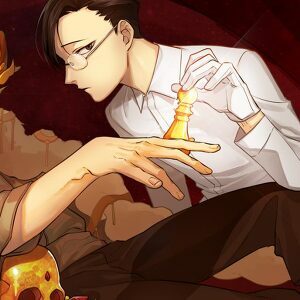 This thriller webtoon is gaining recognition among global comic fans after its was posted on the homepage of famous American cartoonist Scott McCloud. It was also introduced in the Comics Alliance website. You can even find videos of overseas readers jumping at the comic on YouTube. And this shows Korean webtoons can appeal to global readers despite the language and cultural barriers. The key to its success both in and out of Korea is its unique "insertion of motion" technique that amplifies the horror element. Webtoon are now being included in the country's export items list. "With My God" is sold to a Japanese comics magazine and has been made into a manga. Ha'ss "Three-stage Combination Kim Chang-nam" is sold to a movie company in the UK. 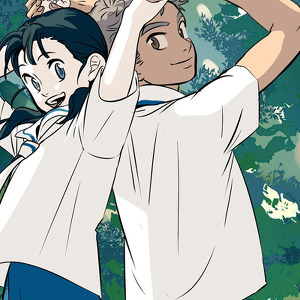 Another popular Korean webcomic "19 and 21" is to be published in France. This is while the evolution of webtoon continues. Lately we're seeing artists using their tablet PCs to draw, creating what's called "Tabtoons." There's also something called "Apptoon"... which refers to smart phone applications that allow users to read an entire comic series. And as the market grows the support for webtoon artists is growing as well. 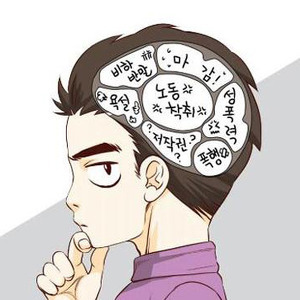 The Korea Manhwa Content Agency for one, has set up a business center, providing workspaces for webtoon artists and related companies at a very low cost. The agency is also offering training courses for cartoonists to help them easily adapt to changing digital environment. Since the year 2000 the webtoon market has been growing 20 to 30 percent each year. In terms of pageview, the number of hits has topped 200 million on Daum and 900 million on Naver... the two major portal sites in Korea. Translate that in money terms, assuming the page has an ad... the amount would reach 34 million dollars. But the problem is all the webtoons are free right now. In the case of Japan, print comics are still the mainstream. Webcomics are mostly those scanned to fit the Internet format. Over in France, cartoonists are using the web to create something new. But the result is not as popular as in Korea. The webtoon business is picking up pace in this country. At the same time we're seeing efforts to share the fun with the rest of the world. 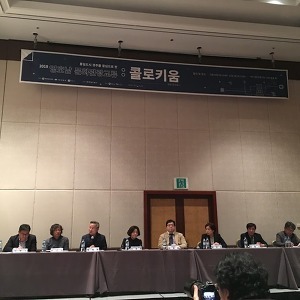 During next year's Angouleme International Comics Festival in France... the biggest such event in Europe... visitors will be able to enjoy a special exhibit of Korean webtoons. In the meantime... people in Korea and elsewhere will keep scrolling down... whether at home or while on the go... and artists will keep creating... because they know the big potential of webtoons.